As in, what's just beginning to peek out from under last year's dead leaves here in Vermont. Fiddleheads are showing in the woods and daffodils too, although no yellow blooms yet-- maybe this week as the temps may hit the 60s. As far as the color green goes, statistics on color preferences will tell you that the color most people choose is blue-- 42% to14% for green--but lately I've been selling more green beads than anything else. In fact, I was working on a set of special order Apocalypto beads (see my post from April 7) and when I e-mailed the customer with pics of the finished work, her comment was that they “weren't green enough”. I rather liked the turquoise as a complement but alas-- not green enough! So thinking I might be seeing a trend here, I started to group some green beads that I had in stock to see if there were some similar hues going on amongst my greens and sure enough, there were. One of the things I look for in what I call “art” are surprises-- little elements of the work that grab my senses and rock me back a bit. 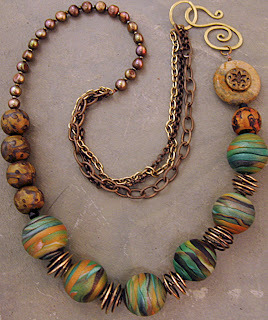 These beads in the necklace below were all the same hue of green and round but quite different in style and texture, creating that little “surprise” that makes the design fun. 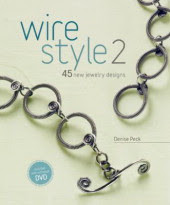 This weekend, I happened upon this information on an older post on Kathleen Dustin's blog. Not only is she talking about green but also about an interesting color blending method I thought I'd pass on. I'd been doing a similar blending process intuitively in developing my color palettes but now that I've seen what Kathleen says, I'll be more conscious of my process. 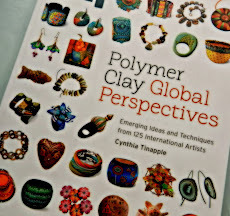 This is the same technique that was explained to me, using acrylic paints instead of clay, when I took a furniture-painting class some years ago. I also noticed, when I dyed yarn with natural plant dyes, that all the colors seemed to harmonize-- must be some chemical in plant colors causing that to happen. Hmmm-- need to do a little research on that! 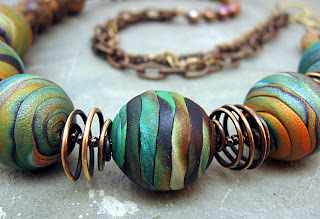 Well, since I was on the hunt for green beads to play with, I found some of my faves, made with Laurie Prophater's “Ancient Metals” technique from an old PolymerCAFE article. I never put them up on Etsy, because I couldn't bear to part with them so now that I've made a necklace out of them, maybe it's time for their debut in my shop. Cynthia Rutledge says “a good base for mixing colors [in a jewelry design] is a light, a medium, a dark, a bright and and an accent” so I added accordingly of both old, recycled and new from my stash and and came up with the Lothlorien necklace. 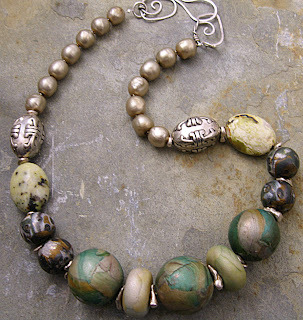 I handforged the silver clasp and, in addition to my polymer beads, I used some yellow turquoise, large silver-plated plastic beads from an African bead mix I got for Christmas last year, and some recycled baroque pearls from an old necklace of my aunt's. Just to break up the balanced design a bit I used some irregular silver nuggets as spacers. So, if you've never been drawn to green, try it. Experiment with the color blending technique. Spring is for new beginnings and that applies to your creative endeavors too. 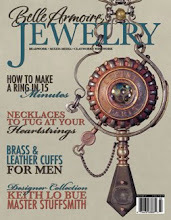 I am drooling over this last necklace on this post! 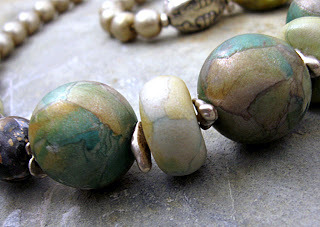 I love the pearls with the polymer clay beads. so pretty! wow. 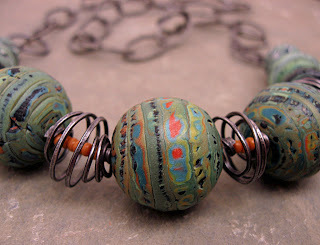 this work is simply stunning, the polymer beads, the composition of the necklaces, just lovely work. Thank you for sharing it with us! Looking forward to your next post. Good idea for the week end to work in green, i'll try it. 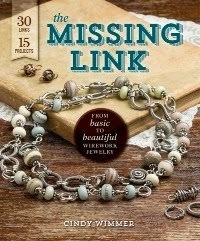 Love the second necklace colors, and the third one, is it watercolor mosaic method ? 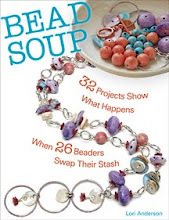 The second necklace was made by stacking thin disks of the colors, loading them into the barrel of the extruder, extruding a thin snake and layering it on a base bead. 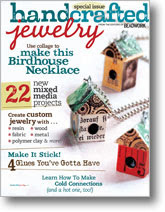 Carol Blackburn has a good lesson on this method in her book "Making Polymer Clay Beads". 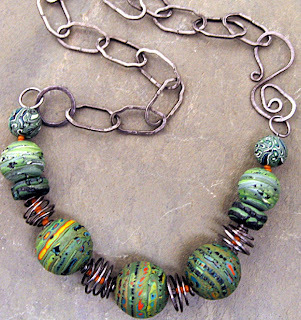 The focal beads in the third necklace are a technique called "Ancient Metals" which I learned from an article in PolymerCafe by Laurie Prophater, which uses stamping, inks and metallic powders. 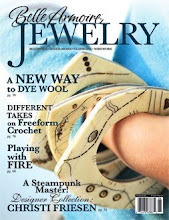 I tore pieces of the sheet I made and applied them to a base bead, somewhat like the watercolor method of Maggie Maggio. 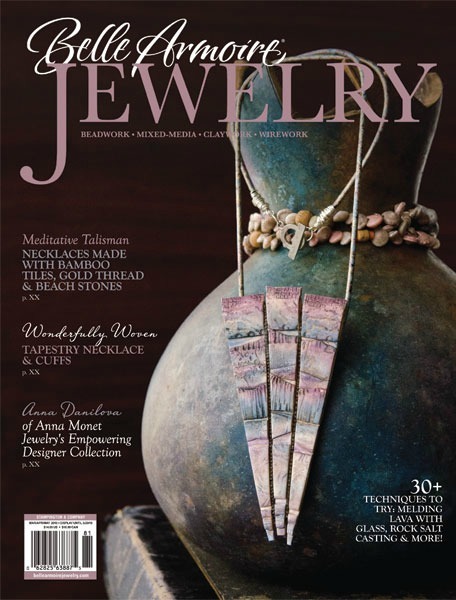 Such incredibly gorgeous pieces! Green is a fave of mine.